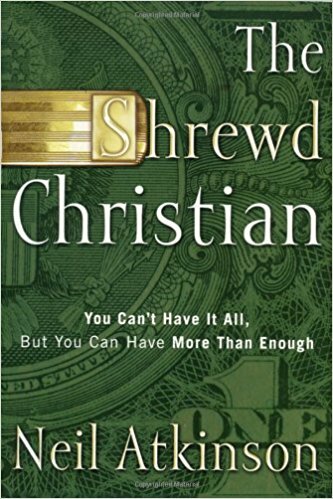 The Shrewd Christian will enable you to conquer money, not merely solve money problems. When you change your thinking, you’ll see your lifestyle change. And when your lifestyle changes, you’ll experience true wealth. If you want to get a grip on your finances, you’ve got to let go of your misconceptions about what it means to be shrewd. Note: Matthew 6:24 “No one can serve two masters; for a slave will either hate the one and love the other, or be devoted to the one and despise the other. You cannot serve God and wealth”. People that serve money will often fall spiritually because their hearts are no focused on God. Note: The chapter is a reflection about the author’s journey to becoming wealthy. He told about how he and his wife became shrewd in their finances, and how God blessed them as a result. God will provide for those who are faithful and responsible. Quote: “The way to serve God is to go through money, conquer it, put it in its proper place, and catch up to the Lord’s plan for us” (34). Note: William Graves let money become his sole motivation; he was jealous that his boss was getting more money than he was and felt he deserved more. Greed was what led him to stealing from the company. Note: Money is not what makes a person successful. William had over a billion dollars but he lost it instantly when he was caught. All of his legitimate hard work was wiped away because of his betrayal. Money does not bring a person success or happiness because you are always looking for more of it. Note: Christians should be aware of five things when it comes to money, greed, fear, bad shepherds, comparison, and competition. All of these can lead a person astray when it comes to money. Note: Coach ability, enthusiasm, ingenuity, and toughness are all attributes that a Christian must have if they are trying to conquer money. They are separate but work together so that the Christian is able to resolve their problem with money. Note: We are worth more than the value of all our possessions. The value of our relationships with God and with others should be what we judge our net worth. Not the amount of toys that we have, or the house and car. Jesus did not sacrifice himself for stuff; he sacrificed himself for humanity. Note: If this is true, then the same logic could explain why money can get between people and God. The brokenness of our humanity allows money to get between people and God. The money is an object, it can’t force its way into anything, but the brokenness allows the love of money to rule our lives. Note: Relationships are the true riches that we can have. Our relationship with God, family, and friends are more important than having a lot of stuff. this means that we need to work hard for those relationships to be rightly ordered. This means constantly pursuing your spouse and working out any problems that might arise together. It also means spending time as a family. Note: When it comes to finances, society and businesses want you to play the game by there rules, but you shouldn’t and you can change them to play by your rules. This means that you think about buying something before you spend money on it, or you stop spending money on something. If you play by their rules, you will always lose. Note: Every amount that you spend, no matter how small counts, it all adds up in the end. If you buy one hundred small $1 things, it is no different than buying one $100 thing. You have still spent $100 either way. Quote: “Paying attention means being aware of the little things, planning ahead, and keeping track of where your money is going. It means using your head and a relatively brief amount of time every week to relieve pain and tension in your life” (94). Note: Being financially shrewd means that you have to be willing to put in the time to gain information about your finances. You need to track your spending in order to have this information. Look for ways to save money where you can; stop paying for something or find something that costs less. Note: 80 minutes per week is not much, and if you can to quality work in that time to track expenses you will be able to have the information to be financially shrewd. These 80 minutes add per week add up and in the end you spend a lot of time during the year. It’s only an hour and twenty minutes, twenty minutes a day; and when you think of all the time a person spend watching TV, twenty minutes is not a lot. Note: Financial responsibilities take up the majority of our time on this side of heaven. If we as Christians practice generosity then our attitude toward God and others will change no matter we feel about giving to begin with. Practice makes perfect or in this sense it is more blessed to give than receive. Note: In building relationships it can be looked at as a spiritual transaction with the Almighty and with others who receive our generosity. Note: The issue with people who lend you money is they are not your friend. The law supports the lender not the borrower. Thankfully we have a Creator who seeks a relationship with us and desires to give us what is best even we don’t think so at the moment. It may be hard at first but we must remember God is our lender and it is to Him we owe it all. Both us and our possessions. Note: It may take time but the key to remember it is not forever. It is best build a savings while in the process of getting out of debt no matter how little you can put aside. It is best to have it so that if something happens you will have some cash and will not have to resort to using credit again. Note: Being a RCEO is a huge responsibility but it pays really well if you’re smart. You not only have to manage the day to day responsibilities but also a plan of action needs to be set in place to watch and keep tabs on expenses. Note: Your first steps as an RCEO are to set up an Information System and a Research and Development System. Next, you should pay attention to aspects of your home, building and grounds, cleaning, organizing, and clothing purchases. Note: It is hard to spend less in this day and age with the constant bombardment of advertisements. Also, with the next big electronic device to hit the shelves every two years it is hard not to stay with the times. So how do you have more if we spend less? By initiating a spending plan and guard against spending outside of that plan. Note: It should be marked that a stay at home spouse is just as important as the one in the work force. Remember you are a RCEO now and that title has responsibilities of its own. If you so desire to get a job then look for volunteering opportunities or a job that is easily flexible and fun and gives plenty of time to be home before the kids. It’s the 21st century and the job market is unique compared to 50 years ago. There are many jobs in the market today that will fit your situation you just have to seek the Lord and do some research. Note: It is easy to get caught up with the amount of money you save from coupons. The issue lies in the fact of how much is too much. Seeing how good of a deal you get off of a certain item entices you to buy it even though you do not necessarily need it. Stick to the spending plan and only use coupons of items that you use. Note: Cooking at home is great way to save money. At times though you have to get creative when it comes to meals so that the meal is something that is always looked forward to. Most importantly learn from your mistakes some of the best meals come from practice. When it comes to children though it may get difficult being frugal with your meals. There are two approaches that can be taken: First, if they refuse to eat let them eat nothing because hunger can change their tastebuds. Second, let the kids eat their favorite sandwich for dinner while you eat a dish appropriated to the budget. Note: It is dangerous to assume anything without hard facts. Investing the difference will not make up the amount of money lost in a extended mortgage. Even though it may be hard it is best to have a mortgage to pay off sooner rather than later. The cost to “rent” money is higher than it seems. Remember to be shrewd! Note: Home is where the heart is. It’s a old saying but it still rings true today. A house is a burden but a home is not. Do the research before making the plunge to buy a house. To rent or not to rent is the question. You can rent a home for a season to buy eventually or rent money to buy a house immediately and live under a burden. Note: It is never wise to buy a new vehicle. You have heard it from your parents that as soon as you drive the vehicle off the lot it is not worth the amount you just bought it for. It’s true! Buy used! An auto is one of two things for us: a expense or a projection of our psyche and our expense. Having a used vehicle based on your need leads to wealth especially if you know the vehicle and are able to keep it up. Note: It is easily to get in a rush when an issue arises so that you may get back to your routine. Take as step back and breath. Allow yourself the space to think clearly and then move accordingly. You might just find out you can do without for awhile. Note: This a hard thing to grasp. How do we discern between exercising faith and being shrewd in a given circumstance? To simply put it having insurance is a shrewd move and it is definitely not a faith buster. Trusting God is the right thing to do but testing God is a whole different ball game. Note: Salespeople are wise at getting what they want but remember you are to be shrewd and to honestly know what you need. Salespeople are good at making you think that you need something but if you have already done your homework on the item then you are one step ahead in the game. Note: If you are not savvy in how investments and the stock market work then you fall within the middle class. For stocks to work you have to have the knowledge to know when to pull your money out for your benefit. The issue is the market is unpredictable. Note: To be shrewd in this area it is best again for you to be wise and most importantly have a friend who is a stockbroker one that you can trust and has your best interest in mind. Sometimes it’s easier said than done. Though if you must invest be safe and smart and act precisely. Note: Live in such a way that is a testimony of who you ultimately serve. By giving first to the Lord and then to the government will cause some eyebrows to be raised. Especially if the IRS comes to audit you with the question what do you live on to be able to give so much away. What a great way to witness! Note: Having a retirement plan is a popular plan to have today. Especially if you want to live your latter years relaxing on a beach somewhere. Planning for the future is important and it is best to have a employer who is willing to invest into a 401(k) with you. Note: Intentional can be fun if it is chosen. Though being intentional about it is not a lifestyle that lost forever but only for awhile. By consistent with your spending plan and remember it’s not forever. Note: If dangers cannot be seen they are hard to avoid. There is a reason why fasting is a Christian practice with its many outcomes. From drawing closer to God and making oneself aware of buried sin and dangers in your life. A chosen life of poverty is a form of fasting.